The properties of hydrogen at extreme pressures and temperatures are of great interest to condensed matter physics, astrophysics, and planetary science due to the element’s putative simplicity and abundance in the visible universe. Of particular interest is the desire to know pressure-temperature conditions over which hydrogen is converted from solid to liquid and from non-metallic to metallic states including such novel states as a possible superconducting superfluid. Investigations on hydrogen at extreme conditions may therefore lead to new physics as well as a better understanding of the interiors of the giant planets. 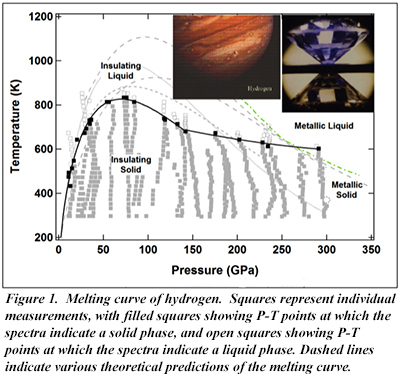 A new paper by CDAC Research Scientist Chang-Sheng Zha and CDAC Director Russell Hemley reports on the first direct spectroscopic measurements of the melting curve for solid hydrogen up to 300 GPa using the externally heated diamond anvil cell. In this work, the unexpected discovery is that the melting temperature remains relatively constant above 140 GPa (Fig. 1), rather than following the theoretically predicted temperature-pressure slope. Furthermore, the spectroscopic measurements suggest that there is a sequence of metallic phases before the predicted transition to the atomic metallic form.